Access control is a means of managing entry/exit within a specific area for example into and around a building. We can install access control systems to suit every market. In its simplest form a door entry system can be installed for a single home or block of apartments. There would normally be a ‘push to request’ switch, with the relevant occupiers name, set into a metal plate on the exterior of the property. This would alert the occupier that they have a visitor by means of a ring on a handset inside the property. By using the handset or a video display it is possible to verify the caller and release the door lock if appropriate. 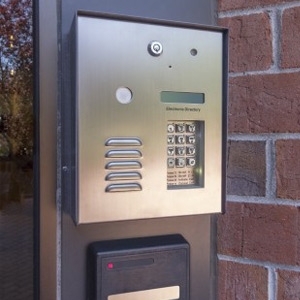 At the upper end of the spectrum we can install an access control system capable of operation in an entire office complex. This could incorporate over 50 doors linked to a computer server and operating system. Authorised staff members could be issued with swipe cards to scan readers set at strategic points to gain access. We can even incorporate biometrics and fingerprint scanning systems. Just simply let us know what your requirements are and we can provide a complete design and build package for a new installation, or upgrade a failing door entry system. We offer maintenance servicing on all door access systems.